Toyin Sanni, former chief executive officer of United Capital has written a book to assist investors participate actively and profitably in the Nigerian financial markets. The book has been endorsed by Mary Uduk, the acting director general of Nigeria’s apex capital market regulator- The Securities and Exchange Commission (SEC). Describing the book as a trailblazer, Uduk at its formal launch which took place at the Nigerian Stock Exchange (NSE), Monday, said Sanni’s guide is among the series of other books by professionals that disclose relevant information and analysis to promote investments in Nigeria. She harped on the significance of the book, and the need for quality information which cannot be overemphasised due to investors want to be certain of the rational basis of their investment decisions before transferring resources. “Riding the Eagle meets this imperative by providing comprehensive and up-to-date information on investing in the Nigerian markets via a roadmap and guide for foreign, domestic, institutional and individual investors alike. It also examines the challenges faced by the Nigerian economy across sectors, past and recent success stories and solutions to some of the nation’s economic and development challenges,” Uduk said. “The book goes into details on the key sectors that drive the performance of the Nigerian economy and what investment opportunities are available for interested investors and motivated entrepreneurs, Uduk added. She also applauded Sanni, for putting at the disposal of the industry, the value of over one decade in the money market and another two decades in the capital market. According to Uduk, the book serves investor interests through its comprehensive and authoritative work on investment opportunities in the Nigerian economy. Urging stakeholders continue to take positive steps to attract and retain both local and foreign investments to stimulate economic growth and develop critical infrastructure necessary for the country’s development, Uduk counselled relevant players like the SEC, NSE & Emerging Africa Capital as well as others to provide investors with accurate, authoritative and independent information to help investors make objective capital allocation, adding that it is key to stimulating investment. 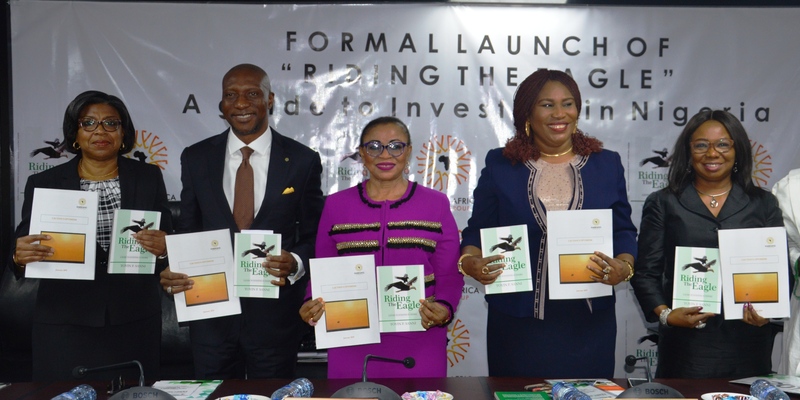 Chairperson of the launch Folorunso Alakija, vice chairman FAMFA Oil Limited, also commended the author of the book, which she described as appropriate and timely for guiding investors interested in Nigeria. While delivering his opening speech, chief host for the event, Oscar Onyema, who is also the CEO of the Nigerian Stock Exchange said the book will serve as a useful resource to those that seek to make impact investments in Nigeria. Sanni, who authored the book said it will help make Nigeria a sustainable preferred destination by providing detailed and concise information for investors. She said the book discusses Nigeria’s current economic challenges and proffers solution to some of them. ‘Riding the Eagle is a guide for local and international investors seeking to exploit the unique opportunities in the Nigerian Economy’ she added.